The Dotwood Tree, the setting for Chapter 3-3, is a large pixelated tree that appears in The Bitlands in Super Paper Mario. Somehow, the heroes had beached the Big Blooper and crossed the Tile Pool. But before they could dry, they saw the imposing silhouette of Fort Francis. "It sure is getting dark," Peach said in a quiet voice. But when they looked up, they realized they were in the shadow of a huge tree. Red winds (white winds cannot be ridden). The Dotwood Tree has three main areas, an outside area, an inside area, and the top. The outside is mainly a series of platforms and blocks. Up above is a Paratroopa near a ? Block containing a Slow Flower. Further up is a Poison Cherbil and a Tileoid B. To the left are some flipping blocks in 3-D, which can be used to reach a platform from which Peach can float over to the right and continue upward. Past a Koopa Troopa is a post, when Ground Pounded with Thudley, reveals a moving platform. Further up are some Tileoid Gs, another Poison Cherbil and a Paratroopa. To the right, there is a pipe leading to a secret area containing several coins. Back outside the pipe are a few more platforms, followed by a door overgrown by bark. The bark must be burned away using Bowser's Fire Breath so that the tree can be entered. The tree's interior is populated by several Tileoids and Crazee Dayzees. This area requires the use of switches that alternate between blue and pink, with different colored platforms appearing depending on the state of the switches. At the start of the area is a pipe that takes the player all the way to a small room at the top. The room contains a Save Block and a blue switch, which must be hit to make pink platforms appear. The player can then go back down to the bottom using the pipe and move upward with the platforms. There is another switch and some moving platforms that can be used to reach a ground pound post, which creates a ladder down the aforementioned switch, allowing the player to return to the post with the pink platforms active. Moving upward further, there is a pipe in 3-D leading to an area with several spikes moving up and down in the floor. Slim must be used to pass them and hit another switch. The newly created blue platform can be used to reach a small opening with spikes at the bottom and a switch in it. Boomer must be used to hit the switch. He must then be placed again, then blown after the pink platforms are used to create blue ones. There are some more moving platforms, as well as a pipe leading to two Chain Chomps, which give up one of Peach's Catch Cards when defeated. Further up, a pipe leads to a room with a moving platforms moving right through a wall of spikes. Slim must be used. There is another switch, but a pink platform traps the player in the room unless Boomer is used to blow the switch after they pass the offending platform. 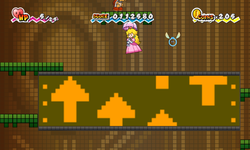 Using the pink platform, the player reaches a spot directly below the room at the top. There is a block containing a Super Shroom and a switch that reveals a door at the very top of the tree's interior. The player must go back down to the bottom and go through the pipe to reach the door. Outside, the heroes encounter Dimentio, who warps them to Dimension D and battles them. He is defeated, however, and leaves the heroes to their work. Elsewhere, he muses to himself about helping the heroes defeat Count Bleck. The top of the tree has several Lakitus and Spinies, as well as a lot of wind. Red wind is solid and must be ridden to a pipe that leads to the end of the level. "This mighty tree stretches to the edge of the atmosphere. Even the inside of the tree was massive. And what about that strange red wind at the top? Dimentio also ambushed you here with dramatic flair." Nobotte! Nobotte! En'yakora Climb! Climb! Heave-Ho! Dotwood Tree is a pun off of "Dogwood Tree" and "dot". This page was last edited on April 9, 2019, at 17:46.